Shamanism is a vast body of knowledge that indigenous cultures accept as a natural source of healing. It has grown in popularity, as it possesses tools that accelerate, activate and empower the soul’s journey. The shaman’s tools fit into daily life as easily as meditation practice. The dictionary defines a shaman as a spiritual leader who is believed to have special powers, such as prophecy and the ability to heal. All beings possess that power, as we each create the life we live. The teaching is based upon the knowledge that all life is interconnected, as we are one spirit, scattered into many bodies. Shamanism is based on the concept of a physical and nonphysical universe that can be accessed from a conscious state, through a portal or doorway. While there, the shaman meets with compassionate beings who reside in the nonphysical universe to heal themselves, the community and the world. Many cultures refer to this realm as the dreamtime, as sleeping and dreaming is one way to enter the realm of spirit. People who daydream slip into trance states. Albert Einstein claimed that daydreaming may have been his secret to creativity and maintained that his visualizations of sunbeams led him to his discoveries. What is great is that everyone has the ability to attain such altered states of awareness. 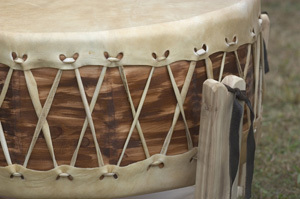 Modern shamans use frame drums as a tool for achieving trance states. Intention and practice are key ingredients in reaching and maintaining a focused state of awareness. The dream state is based in metaphors and symbols; it is up to you to decide the meaning of a dream or a journey. Self-discovery is about having faith and trust in the interpretation of these journeys, which are different for everyone. Shamans use this technique over time, deepening and developing their relationships, while fostering the ability to intuit and translate information into a usable formula for daily living. Josephine M. Joseph is a Karuna and Reiki master teacher, Shamanic practitioner and owner of www.lightjourneys.org. 623-698-6899.